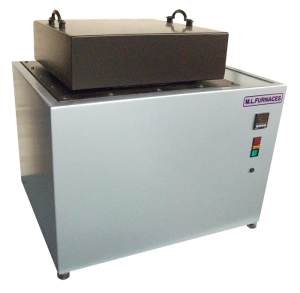 This furnace is designed for use by the small foundry operator for metal or glass applications. It is a low cost simple unit, the smallest version being designed to work from a standard UK electrical socket. The furnace casing is steel attractively finished in blue hammer finish paint, with the lid finished in black. Low thermal mass insulations are used for efficiency and together with double skin construction ensures that the furnace casing remains relatively cool. The lift-off lid affords obstruction free access to the work chamber. As an option, a lever operated side moving lid can be fitted that keeps the hot face away from the operator at all times. The furnace can be floor or bench mounted and is fitted with an earth leakage circuit breaker for operator safety. A type N thermocouple is fitted for long life and accurate temperature sensing, and thermocouple break protection is fitted as standard. Heating: The heating elements are high quality graded spiraled wire, cast within the chamber refractory wall. Power to the heating elements is controlled by solid state relays for accuracy and reliability. Controls:The controls are on the side of the furnace. A microprocessor based digital temperature controller with set-point and process displays, provides accurate fully automatic control. As an option, an adjustable independent digital over-temperature controller can be fitted. Options include: alternative models of temperature controls / programmers / recorders / communications / timers / lift aside lid / crucibles etc.